A spectacular game with a number of tactical blows will normally more appeal the audience than a more positional played game. Sacrifices and counter-sacrifices are not only fascinating but often also much easier to understand than the so called quiet moves. It is no coincidence that I chose in my blogarticle mijn mooiste zet for only tactical positions. Explaining well the concept of critical moves, is not easy with quiet moves which often differ little or nothing with the alternatives. Nevertheless I won't deny that I can also enjoy a lot the quiet moves. As there are often in a game many of them which are trivial, it is not redundant to describe what can be a beautiful quiet move. In my opinion the most important characteristic is that the move must be rare and at the same time functional. Recently I bumped via the blog of David Smerdon on a game between L'Ami-Krasenkow in which the remarkable move Bh8-a1 was played. A bishop in the corner has a minimum of squares to where it can move to. So moving a bishop on purpose from one corner to the other one, is not what we see every day on the board. Thanks to an old article of the fantastic website of Tim Krabbe we know that this move happens once per x thousands of games. Next would be nice to know which move is the most rare one. Well except some minorpromotions all moves have been played at least once in practice. This with the restriction if we use the long notation. If we use the short notation then I am not so sure of that even if we don't take minorpromotions into account. A knight on the rim is grim, is a known proverb so we won't play a knight easily to the side of the board. Putting a knight in the corner is obviously even less done although not very rare as Herman Grooten recently illustrated in some articles on schaaksite: vier maal een paard op h1 en gespot 56 paard naar de hoek. Really weird it is when you put a knight in the corner when you have the choice between 2 knights. I mean you play a move like Nba8, Nca8, Ngh8, Nfh8, Nca1, Nba1, Nfh1, Ngh1. 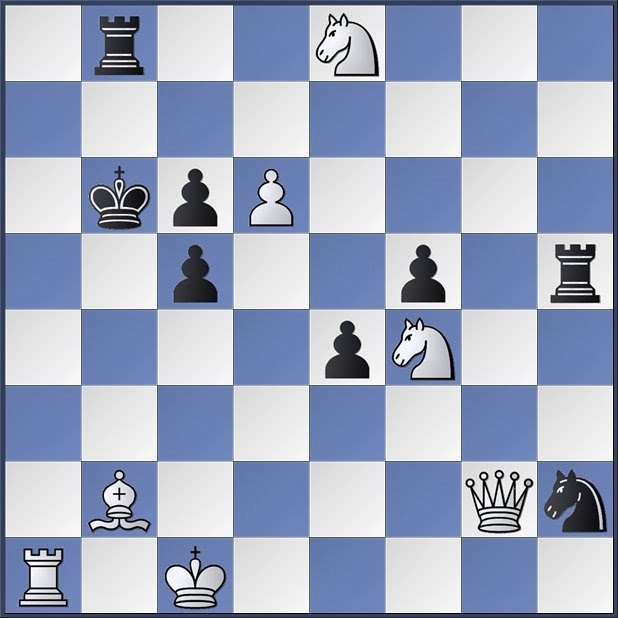 I played such move once in my career against Alexander Raetsky whom after the tournament became grandmaster. So far the special moves but really nice things can be seen when several quiet moves are combined. Recently Luc Winants deservedly informed us about a nice moment at move 31 and 32 in his game against Moens. We may rightly speak here about a bristol clearance. A lighter piece clears space for a heavier piece. In the problemworld this is well known but in practice you see such things very rare. A step further goes the below analysed opening in which i already discovered in 1997 a lovely novelty. If I can trust my databases then the move is still not played in practice. Here the heavier piece clears space for the lighter piece. In my old book of problems this is called a Turton-Bristol but I also found different names so there is discussion about what is the right name. Finally I also want to show a real problem which I built 20 years ago as a non clubplayer. There exist many more beautiful creations with this theme but it sounds to me anyway appropriate in the context of the blogarticle. The solution is mentioned on the bottom of the article as maybe some readers prefer to try first themselves although I expect it must be easy if you read this article. I strongly doubt that such problemmoves are possible in tournament practice. Anway schaakcompositities clearly show that chess hides many more possibilities than we will ever see in a boardgame. Therefore I also think that we shouldn't search too fast for the rare/ problem-moves in a game. It is not with that sort of moves that we will decide a game in our favor or you have to be a very strong player like the grandmasters in above examples. Loydse clearance: A piece clears space for another piece which uses it in the opposite direction.